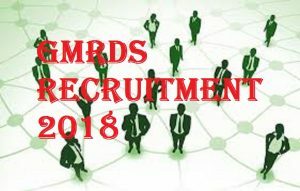 GMRDS Recruitment 2018 notification was out from the Gujarat Mineral Research and Development Society and has updated at the legit website www.gmrds.gujarat.gov.in., you can check or download the main notification as well as can apply from 24th Jan to 03rd Feb 2018 for Mines Supervisor and the last date for Royalty Inspector,Surveyor posts is up to 09th Feb 2018. Check the full status of 50 Mines Supervisor, 40 Royalty Inspector, 22 Surveyor posts this notification in the below. Latest Update (1st Feb 2018): GMRDS has updated a new notification of 22 Surveyor posts. Check it full details below. GMRDS Notification 2018: Hello, to the job hub name called @recruitmentindia.in., where you will search for any type of notification along with them, you will also search exam admit cards, results, and many other related to the recruitments at here. So, today’s topic is about on Gujarat State Govt latest Employment news which is issued by the GMRDS organization. The Gujarat Mineral Research and Development Society is one of the members of Gujarat State Govt public sector family. Now, the GMRDS has come with the 50 vacancies of Mines Supervisor Posts and 40 vacancies of Royalty Inspector posts, 22 Surveyor posts for job seekers in Gujarat location. The Mines Supervisor is come under from State Govt of Gujarati. Look for more Latest Gujarati Govt jobs of 2018 at here. Gujarat Mines Supervisor Govt jobs Chances in 2018-19 are offered in the month of the Jan 2018. Let’s talk frankly, for few moments. Everyone usually prefers the high amount of salary jobs to settle in their career so fast. Is that right or not? If you are also one of them, then this notification will be so useful to you my friends. Because at this time with this GMRDS Latest vacancies notification of 2018-19 has given with the amount of 16000/-per head. So, guys don’t skip this notification at any cost. Enroll your names within the last date of online registration and submit your bio date or CV Format resume. Find some latest Govt jobs in 2018 which are related to the Central Govt jobs. Mines Supervisor – Participates must possess in Diploma/ Any Degree from the any Unversity or board of the concerned State/Central Govt is necessary. This is the minimum qualification and higher schooling certifications also will be taken. Royalty Inspector – Candidates who have the minimum schooling qualifications of M.Sc. in Geology or Applied Geology/ B.E. or B-Tech in Mining Engineering with 55% of academic year score are necessary. Well talking about the age relaxation, applicants must not be less than 18 years of age. As per the main notification, the applying candidates should be in between 18 to 30 years of aged peoples will be allowed for hiring. The Gujarat Mineral Research and Development Society was offered reasonable salary packages of Rs 16000/-per head. The officials are clearly given the full details to enhance your all doubts regarding the pay scale. Check out the main notification. The selection process of this recruitment notification is going to the Written Test and Interview Pattern. Surveyor: Diploma in Civil Engineering/I.T.I. Surveyor with 55% marks. Preference will be given to the candidates with following eligibility. Candidates must be well versed with basic computer knowledge. The candidates should have good communication and presentation skills. Preference will be given to Gujarat domicile. The Gujarat Mineral Research and Development Society was offered reasonable salary packages of Rs 9500/-per head. The officials are clearly given the full details to enhance your all doubts regarding the pay scale. Check out the main notification. “Gujarat Mineral Research and Development Society, Gujarat. Application forms links to Gujarat Mineral Research and Development Society Recruitment of 2018 are placed in the below of the page. The totally 50 Mines Supervisor, 40 Royalty Inspector, 22 Surveyor posts are come under of the State Govt of Gujarat because the GMRDS organization is the State Govt department of Gujarat. So, this isn’t a mixed sector, it is full authoring by the Gujarat Govt. If you are searching the govt jobs on a base of Mining Field, then we are damn sure this will be the best of best notification to you for getting the Govt jobs in GMRDS Department in Gujarat state. Approximately, 50 Mines Supervisor and 40 Royalty Inspector are waiting with the newcomers or new freshers of 2015-2017 passed out batches. The GMRDS Mines Supervisor minimum qualifications are Diploma/ Any Degree and M.Sc. in Geology or Applied Geology/ B.E. or B-Tech in Mining Engineering from the any University or board of the concerned State/Central Govt to participating in this notification. But think that if you once get qualified this notification. It will be your life turning point. Because the salary packages in Gujarat Mineral Research and Development Society is so reasonable to everyone. For each one, the officials have offered the Rs 16000/ package and Rs.9500 for Surveyor per month. it’s so reasonable. Well over advise is without goofing your valuable time using this wonderful chance and register your names into it. So, soon we’ll catch you with the Examination hall tickets for GMRDS Written test. Firstly, visit the legit website www.gmrds.gujarat.gov.in, search for main notification and download the notification along with the offline application forms of 2018. After filling up, attach all docs with the Offline application form and send on or before the latest dates of submitting. I am belongs to Maharashtra am I eligible for this post..?